We Can Help With Any Retaining Wall Project on Lake Norman, Mountain Island Lake, Lake Hickory, Lake Wylie, Lake Rhoadhiss, High Rock Lake or Lake James! Retaining walls serve an important purpose for any home landscape that is near a body of water. Not only are retaining walls highly functional, but they can also add an aesthetically pleasing effect to your property. 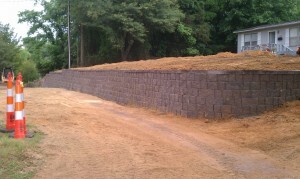 At Renegar Construction, we specialize in retaining walls that are not only purposeful, but pleasing to the eye. Retaining walls have two main purposes. First, they protect land that is near water from erosion. And second, retaining walls can direct water into a designated area or deter it from an area of land that you don’t want water to enter. If you live in the Mountain Island Lake area, some of your property may be sloped and difficult to make use of. Retaining walls can also eliminate this problem by creating an open and practical area of land that wouldn’t have been usable otherwise. When we build a retaining wall for you, we will only use the highest quality of materials. From modular block to natural stone, we will consult with you to build a wall that will match and complement the existing features of your property. Not only will we build a retaining wall that will look nice, but we will also consult with you to construct a wall that will allow you to get the most out of the newly constructed wall and the surrounding property. We have a reputation for building some of the most aesthetically pleasing and functional retaining walls in North and South Carolina. Our company’s services are affordable, reliable, and most importantly, honest.